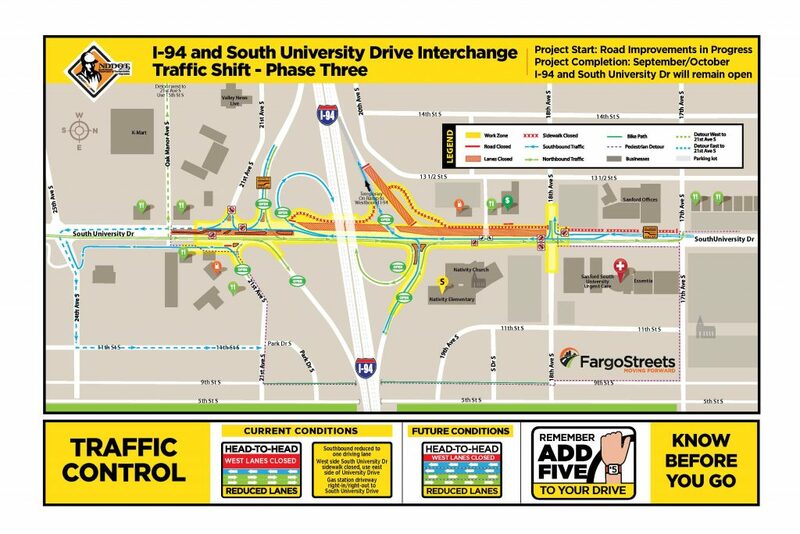 Starting Sunday, August 5, contractor for the North Dakota Department of Transportation (NDDOT) Fargo District and City of Fargo Interstate 94 (I-94) and South University Drive interchange project will flip traffic to the opposite side of the roadway to start the third phase of the reconstruction and infrastructure improvement work. By early morning, Monday, August 6, all traffic will be moving head-to-head on east side of South University Drive between 17th Avenue South to just under the I-94 bridge. Motorists will begin to use the newly constructed east side of the roadway to allow crews to start on roadway removals of the old west side of South University Drive. SOUTHBOUND: one driving lane will be open from north of 18th Avenue S to Oak Manor Drive. An additional southbound driving lane will open to drivers later in the phase. CLOSED: sidewalk on the west side of South University Drive from 17th Avenue to under I-94. The detour for pedestrians is east of South University Drive by use of 17th Avenue S to 9th Street South to use the Lincoln Tunnel under I-94 to 21st Avenue S.
The reconstruction project work on the west side of South University will continue into early fall to complete roadway removals, underground and paving operations. Once complete, traffic will then shift to the outside of each side of South University Drive in their respective direction of travel to allow crews to work in the center of the roadway.